AW-Lake Company introduces the MicroTRICOR TCM-100 Coriolis Mass Flow Meter – the smallest TRICOR Coriolis meter designed for the accurate measurement of very low flow rates. This new mass flow meter is suitable for dosing, blending and batching in applications such as chemical injection, precision painting and coating applications, and batch processing associated with liquid or gas handling and dispensing. The new multivariable instrument reports mass flow, density, concentration, temperature, and volumetric flow in one device. Without any moving parts such as gears that require maintenance or can corrode and fail, the TCM-100 Coriolis Mass Flow Meter uses smooth tubes through which material flows at rates as low as 5cc/min (300 grams/hr, .001 gallons/min). Unlike volumetric flow meters, the MicroTRICOR Low Flow Meter measures mass instead of volume, providing for greater accuracy as the mass of a fluid or gas remains constant and is unaffected by changing process conditions such as temperature, pressure and viscosity. As a result, process engineers get truer readings in all conditions from the MicroTRICOR Mass Meter. In addition, the unique compact dual tube design provides for a more balanced system with greater resistance to external vibration and pulsating flow. Offering fast response times, the MicroTRICOR meter deliver high repeatability with long-term operations. 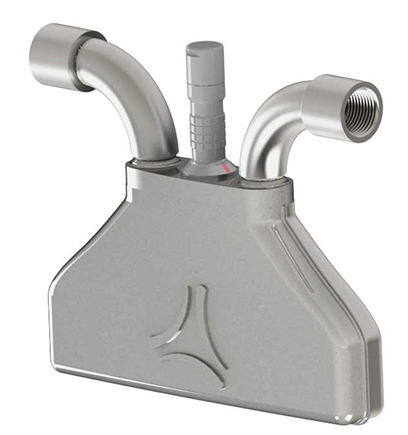 With no filter requirements, the low flow mass meter requires little or no maintenance. Units are flushable and simple to clean. Having all wetted components made of 316L stainless steel, this meter is compatible with most fluids. Multiple connection types are available including NPT, AutoClave, and tubing. The TCM-100 Mass Flow Meter is suitable for high pressures up to 5,000 psi, and is EX certified with ATEX, IECEx, EAC certifications and a pending CSA rating. The MicroTRICOR Meter is sold with TCE transmitters that are available with analog, frequency pulse and status outputs. Transmitters can be ordered as panel mount or remote field mount versions.